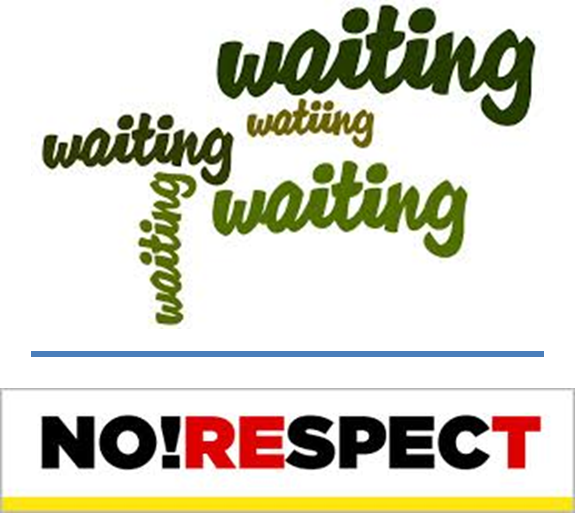 SCD Group: Waiting: Members are Sick and Tired of Waiting! I’m tired of waiting on “service people.” Waiting is almost as annoying as all those political ads. The annual meeting of members started 8 minutes late. No big deal, right? Well, BS! Wasted time for all of waiting. And, it says that our association disrespects us and the value of our time. Associations: don’t do this! Start on time. Respect and value the time of your members. This rant started because today, the hvac service people told us they would be at our home between 8 am and noon. So, we waited. And, waited. I went to my 11:06 tee time so my wife waited and waited. At 12:50, someone called to say “our service person now has time to come to your house.” What?! So, my wife kept waiting. He finally showed up at 1:10. He finally came in and started work. Later, he sat in his truck a while (perhaps doing paperwork?). Finally, my wife said, “I have a 2 pm meeting I can’t miss.” His response: “You can leave.” Really! A friend of ours went to a doctor’s appointment last week. He sat in the waiting room for an hour. Finally, he was ushered in to an exam room ... where he waited another 50 minutes. Finally, he went back to the receptionist and ask when he could see the doctor. The response: “Oh, she’s running late.” As my friend started to leave, the receptionist asked, “Do you want to make another appointment?” “No,” my friend said. He’s now searching for a new doctor. What is up with “service companies” and “associations” making members/customers wait? If fact, why do we call it a waiting room ... starts off badly. Do companies/professional firms/associations have access to email, text, phones and other tools? If you’re running late, is it too much to call and alert your customers/members? Come on ... it’s time to R-E-S-P-E-C-T our time! Otherwise, we’ll look elsewhere!